Explanation: On Monday, January 26, well-tracked asteroid 2004 BL86 made its closest approach, a mere 1.2 million kilometres from our fair planet. That's about 3.1 times the Earth-Moon distance or 4 light-seconds away. Moving quickly through Earth's night sky, it left this streak in a 40 minute long exposure on January 27 made from Piemonte, Italy. The remarkably pretty telescopic field of view includes M44, also known as the Beehive or Praesepe star cluster in Cancer. 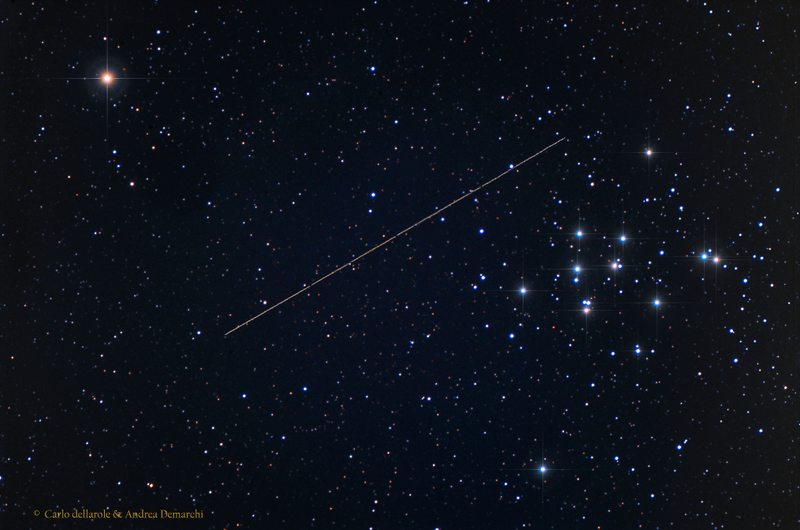 Of course, its close encounter with M44 is only an apparent one, with the cluster nearly along the same line-of-sight to the near-earth asteroid. The actual distance between star cluster and asteroid is around 600 light-years. Still, the close approach to planet Earth allowed detailed radar imaging from NASA's Deep Space Network antenna at Goldstone, California and revealed the asteroid to have its own moon.